Division Chief: Jack L. Lancaster, Ph.D. The Biomedical Image Analysis Division (BIAD) consists of four sections that support a broad range of research projects at the Research Imaging Institute (RII) through systems administration, data analysis, and software/database research and development. Additionally, BIAD is a scientific research division, developing and publishing validations of image processing tools and methods. BIAD provides RII investigators with specialized software to assist in conducting complex data analysis and visualization for research. Because image-processing software can be customized in-house for a wide variety of research protocols and imaging systems, researchers are free to experiment with unique image forms. 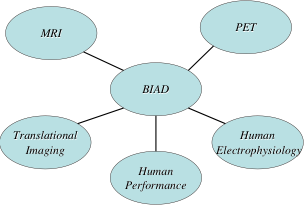 Research within each RII Division is naturally integrated through services provided by BIAD as indicated in the graphic below. The table below section and summarizes the main responsibilities for each of the four BIAD sections. Links are provided to each section for more specific information.